Every fortnight, up goes one spoiler-free panel from the latest issue of Brightest Day, the bi-weekly event, currently reinvigorating many of DC's iconic characters Extreme Makeover style. Here, Hawk proves not all the white ring's advice is gospel. 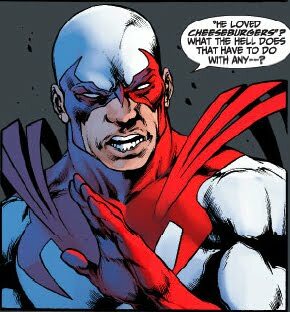 It's a small attitude-ridden panel true, but it's the best Hawk's read since the old Hawk and Dove mini-series, that first introduced me to Rob Liefeld. Like most characters in last week's Brightest Day #6, Hawk it's good to have you back. Thanks for the great comments ToB, I totally agree! I to love the Kesel's run, and hope that Kestrel comes back in he pages of Brightest Day. Even though that's a grim character - I think H&D need their own arch-nemesis again. As for Monarch and what it did to Hawk, I skip over that part looking back - memory isn't what it was you know, and oddly enough it seems only certain parts of the 90's continuity is affected, but hey it works for me :D.